Who are the Gods? What are the Gods? Meeting with and talking with people who think and feel differently, both online and in person, always makes me stop and consider my own perspectives. Spiritual growth doesn’t just happen in the Other World or in your heart – it also happens in your mind, in dialog, in your relations with others. I mentioned my friend Katrina the other day in my post about astrology. It’s been awhile since I’ve had a long conversation with her, but she was always more of a soft polytheist. She’s a very intelligent individual, and also open-minded and interested in having discussions. She loves comparative mythology just as I do. We always have some interesting exchanges. Being more of a hard polytheist, Katrina helped me see different perspectives in a more positive light. She is definitely one of my role models and I always think of her when the nature of Gods comes up. And it often does in such a diverse world! My feelings grow and evolve according to my experiences, studies, and moods. For the most part, I have experienced the Gods as separate beings. Before Druidism, I had a very strong relationship with the Egyptian Goddess Bast. When our time together ended, she never became Brighid or any other Goddess. Some of my Wiccan friends, who have some Norse leanings, were doing a drawing down with Freya. Not once during the ritual did I get the impression that Freya and Brighid were the same being. In fact, experiences during that ritual lead some of us to believe that Brighid definitely did not want me to work with Freya. I will also add as an aside that, despite Freya’s connection with cats, there was nothing in that experience that connected her in any other way to Bast. I will not claim to be an expert on the matter. I will not even claim to be an incredibly practiced spirit worker. When I have been lucky enough to get into a productive trance state, and when I have been able to meet with my Gods, the question came up once or twice. The Gods always laugh it away as a silly concern and ask me to focus on the here and now. It’s become a bit of a mantra to me. When I ground and center, I focus on the here and now, even saying those words to myself as I breathe in and out. In that moment there is only me, the altar, the nature around me, my ancestors, and my Gods. And my Gods seem to be individual. They are part of nature and connected by nature, yes. Brighid is the fire. An Dagda is the passion. The Cailleah is the snow and wind. Manannan is the sea. But to me, that isn’t it. Hestia, a Greek Goddess, is also fire. Yet she isn’t Brighid. They are of different lands, cultures, and lore. To me, they are related through nature but distinct. They can be described as an archetype but are more than that simplification. Much as my sister and I are both archetypes of daughters, wives, sisters, women, and even artisans, we are still different people. We are united by the same forces of nature that unite as all – a web of creation and destruction that, to me, is mindless. It just is: creating, destroying, and uniting us in those simple truths. To me, my Gods are intimately tied to a culture. I don’t see this as a limitation of them. I always say I have an agnostic side to me, and that side argues that, yes, they could be more than that. But they present themselves to me in that way, using that symbolism. The symbolism of the Irish culture helps me better access them. There is power already invested in those symbols and it works for me. Perhaps Brighid really is the same as Hestia. Perhaps I am only seeing one head on a hydra of fire. Perhaps Brighid and Hestia really are the same as Bast and Lugh and Odin, and any other number of deities… But I haven’t experienced them as that. I continue to work with the Tuatha de Dannan using the symbolism of the culture associated with them – the culture of some of my ancestors. I am equally comfortable going outside and honoring the sun, the wind, water, lightening as is without cultural symbolism. When some argue that hard polytheists don’t do that clearly haven’t met many and create a false dichotomy as my friend Grey Wren would say. Hard polytheists aren’t all so rigid. I think the vast majority of us are more fluid and open to the mystery of who the Gods really are. We understand that mythology is symbolic rather than literal. We think and feel the way we do because that is how the spirits present themselves to us. We do as we do out of integrity to ourselves and the spirits. It is what makes sense to us. However, that integrity is no excuse for the haughty, evangelical nature some hard polytheists might present to others. Thankfully, that sort seems to be the minority. A corner of my Nature Spirit altar is dedicated to the deer spirits. 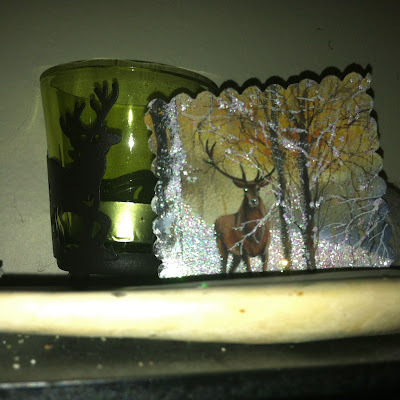 Behind a jawbone is an image from a Solstice card I kept and a candleholder of silhouetted stags. My recent post about cleaning a deer skull I found generated some interest in that spirit animal and my experiences with it. It made me want to write something more in depth about my evolving relationship with deer spirits and the lore surrounding them. Then there is my dietary choice. As a vegetarian, I began to relate to their eating habits. Plenty argue that eating meat connects humanity to the natural cycles, but by relating to a deer as a vegetarian, I realize that my diet is not so far removed from nature. I often tell people that, in this life and at this time (sans survival scenarios), I am connecting to nature as the deer. I do my best to eat local and sustainable food – but I’m aware that my hooves will trample creatures from time to time. I can be very peaceful and not cause bloodshed, but if attacked I have my antlers to defend myself with. I eat plants and will one day be cut down – either by a predator or time itself. And when my body rots, the other plants and animals will take me back into the Earth Mother. I am not the hunter – I am the hunted who knows there are predators in the wood and I must be careful. It keeps me humble and alert. It is simply a different way to connect with nature – no more or less valid than the deeply spiritual experience of the hunter and meat eater. Meditation has brought the deer closer to my soul, finding me an ally in the spirit world. At first it just kind of happened out of the blue. Deer would show up – bucks and does. Sometimes the deer would transform into humanoid shapes and talk or laugh. More recently, when I encounter frightening things or have nightmares, the buck comes and waves his antlers, sometimes shredding the shadow. I’ve ridden his back a couple times and he loves offerings of apples. Once, while meditating in the forest behind my parents’ home, I opened my eyes to see a herd of deer around me – a harem, it seemed, guarded by one buck. He looked at me and made his gutteral call several times, the mist rising from his nostrils like smoke. He stamped his front left hoof in the ground, bringing up soil and leaves. This was no helpless herbivore – this was a warrior and guardian. I stared back in awe and fear but did not move. He could have charged. They could have stampeded over me if they wanted. After a minute that felt like an eternity, the herd slowly melted back into the forest as if they never were. Truly, of all the times I’ve encountered deer in some spiritual vicinity, this, and the day I found the whole deer corpse, stand out among the most influential. Learning about the lore surrounding deer has been informative and transformative. Like North America, Northern Europe also has deer but they are generally of the red variety. There is also evidence that reindeer existed in Scotland in prehistoric times and some connections have been made with other cultures, who herd them, and the legends of the Celts. Could such a practice have existed in antiquity? Could it have remained in the Celtic imagination and transformed through the ages? Although we often think of boars and, especially, cows with regards to the Celts, findings by archaeologists lead them to conclude deer were the most widely hunted creature and thus held much importance. Many stories that feature the eldest animals, such as the Eagle and Salmon, also feature the stag. Some scholars assert the existence of deer cults lead by women in northern Scotland. The lore surrounding Flidais, a lusty spirit/Goddess/character of Irish fame, connects her to deer, leading some to suspect deer cults existed there in the misty, pre-Celtic past. Unfortunately, many compound her with Artemis so it’s very difficult to know more about her without finding parallels in other cultures or relying on UPG. The old stories are rich with giant women and wee women who herd and even milk the deer as cattle. These same women can even transform into deer. While there is only so much information out there on Flidash, stories abound about Cailleach spirits. I pluralize because, the more I study, the more it seems there is more than one and that Cailleachs are very localized. They control the weather for certain regions (especially wind, snow, and storms) and herd deer. Often, they’re shown as protectors of the deer. Hunters must ask for permission before taking one of her herd. In some stories, she gives the hunters very specific descriptions of who to kill, and punishes those who don’t listen or don’t ask permission. To me, this shows that there was a definite understanding that hunters should be responsible and not decimate the herds. If too many deer were taken, or if only a certain kind were taken, the population would weaken and there would be less food in the future as a result. The Fionn legends are filled with deer: Ossian’s mother, for example, was turned into a deer and some stories say she was in this form when she gave birth to him. The symbolism even enters into Arthurian legend. Merlin is said to have ridden a deer when he went mad. Finally, deer have some connection with the Otherworld and death. Some of it is connected with Cailleach traditions (poor weather brings death, winter can represent death, she kills disrespectful hunters, etc), some through the general otherworldliness of deer (they are often very quiet and shy; legends connecting them to the fairy realm), and through what is observable – the cyclical nature of their antlers and their being hunted and sometimes sacrificed. I have a little altar to the Nature Spirits that is always changing. Soon, I’ll need to expand it in some way to make room for the deer skulls I’ve obtained. It’s important to me that I continue to work with the deer spirits. I definitely feel a strong connection and want to work on learning more and deepening my relationship with them. The Driving of the Cattle of Flidais, Book of Leinster. Brock, Juliet Clutton & MacGregor, Arthur. "An End to Medieval Reindeer in Scotland." Society of Antiquaries of Scotland (1988), pp. 23-35. Carr-Gomm, Philip & Stephanie. The Druid Animal Oracle: Working with the Sacred Animals of the Druid Tradition. Fireside (1994). D'Este, Sorita & Rankine, David. Visions of the Cailleach: Exploring the Myths, Folklore and Legends of the Pre-eminent Celtic Hag Goddess. Avalonia (2009). Freeman, Mara. Kindling the Celtic Spirit. Harper Collins (2000). Geddes, Arthur. "Scots Gaelic Tales of Herding Deer or Reindeer Traditions of the Habitat and Transhumance of Semi-Deomesticated 'Deer', and of Race Rivalry." Folklore, Vol. 62, No. 2 (1951), pp. 296-311. McKay, J. G.  "The Deer-Cult and the Deer-Goddess Cult of the Ancient Caledonians." Folklore, Vol. 43, No. 2 (1932), pp. 144-174. Michael Fassbender Plots Movie About Celtic Warrior Cuchulain | /Film.